A new method is proposed for estimating the porosity of paper by comparing the electric current passing through a wax-printed channel patterned on the paper surface with that passing through a hollow polydimethylsiloxane (PDMS) channel. To ensure the accuracy of the estimation results, the paper channel is sandwiched between two flat PDMS plates to minimize evaporation losses and replicate the surface properties of the hollow PDMS channel. It is shown that the measured current values in the PDMS and paper channels under driving voltages of 10–50 V are consistent with the results obtained from Poisson–Nernst Planck simulations. Hence, the validity of the experimental model for estimating the paper porosity is confirmed. The porosities of three commercial paper samples are estimated experimentally and compared well with the values determined from the basis weight and thickness data provided by the paper manufacturer. 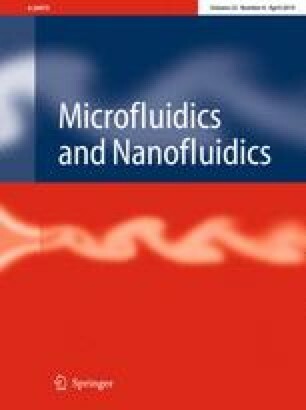 In general, the results confirm that the proposed method provides a low-cost and effective means of evaluating different paper materials for microfluidic paper-based analytical devices (μPADs). The authors gratefully acknowledge the financial support provided to this study by the Ministry of Science and Technology (MOST) of Taiwan under Project No. 104-2221-E-006-154-MY3 and 107-2221-E-006-127-MY3.